I got a request the other day for how I sculpt scrollwork on shoulderpads. Actually I got the request a few weeks ago and I completely forgot like an idiot. I apologize to the person who asked for it. I mentioned to them that it's something I've done before and it's not too hard to do really. 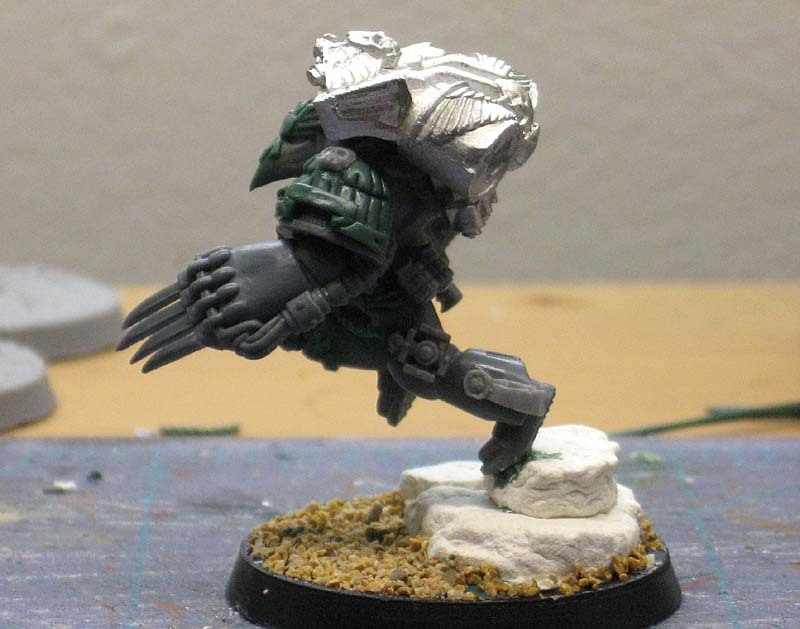 The first time I tried something like this, it was for a Raven Guard Shrike conversion and it was located on his greeve and not his shoulderpad. The process is the same regardless of where it goes. To show you all how I sculpt that particular piece or any scroll work for that matter, I made this series of diagrams breaking down the steps to it. It's not that hard to do really, you just need to make sure your cuts line up and you get your indentations in the right place. This is about creating an illusion more than anything else. Part of it is done with greenstuff and part is done with your painting afterwards. Together, they make for a convincing illusion. The mix of yellow to blue is 1:1 since I haven't found a need to go heavy one way or another. On a rare occasion, I'll go heavy with the yellow if I want what I sculpt to be a bit more flexible in the end, but I'd say 99.999 percent of the time I use equal parts of both. When it comes to tools need for this project, it's the GW sculpting tool and an X-Acto blade. Sometimes I use other objects like nails, paperclips, etc. to create certain effects if I need them and can't do it with my first two tools, but you won't need them here. 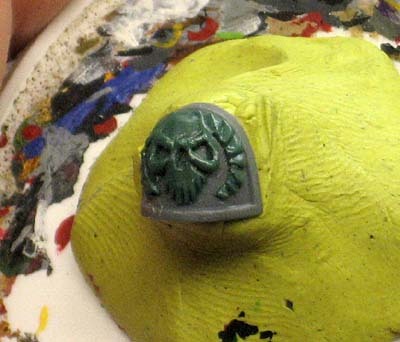 The first thing you do is lay down a thin layer of greenstuff where you want your scrollwork to be. It needs to be big enough that the entire scroll can be cut from it. We won't be doing any adding of material with this process, only cutting portions away. You don't want it so thin that you can't make indentations in it and you don't want it so thick it looks odd. Maybe two millimeters or so should be enough to pull this off. This is perhaps the trickiest part... making sure the sections you cut away all line up. You'll cut away the upper corner on each side and the middle of the bottom. By cutting away the upper corners, you set the width of the top portion of the scroll and how far the lower portions come out from underneath. Cutting the middle from the underside sets the height of the top portion of the scroll and how far the bottom portions fold under. Here's where we make this thing come alive. We're going to make two indentations (A and B). The first one (A) will form the outer edge of the upper piece of the scroll and then angle down and in towards the lower corner creating the folded portion. The second (B) is going to create the bottom edge of the upper piece of the scroll. These two indents help us visually separate the top piece of the scroll from the folded part from the bottom piece of the scroll. When you make your indentions, you're not trying to just cut lines into the greenstuff. Ideally, you'd like to be able to make a slight indentation and then fade it outward from there. If you look at actual examples, the "fades" work outward from the upper piece of the scroll work. This shows what the piece should look like with some simple shading to help with the illusion and the optional triangle cut from the lower portion of the scroll. Once you get the process down, you can do things like combine it with additional elements like I did for one of the Storm Warden Terminators I did last year. When it comes to sculpting other elements, I first try and break them down into layers and then into simple shapes. I'll start with the lower layer, sculpt that, let it cure and then move up from there. Most of my work is subtractive within each layer. The additive work I do is when I start a new layer on top of a previous one. In this example, it's a single layer sculpt if you will that I end up cutting away small portions from around the edge. The addition of a few well placed indentations (for things like the wings) and you can make a fairly complex icon with ease. 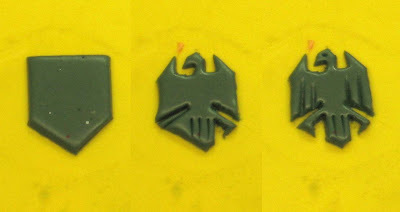 Looking at Shrike's shoulderpad here, we can break it down into two layers. The first one being the bird and the second layer being the scrollwork on top. I don't try and do it all at once or combine the layers. Splitting them apart and working on them individually makes the sculpting much easier to do. You can't be in a rush to get this done either. Once you've done what you can on a particular layer, you need to let that cure completely before adding more to it. This is important because you don't want to ruin you underlying work as you remove excess material from upper layers. With some "organic" sculpts, you might want to do them in stages even if they are one layer pieces. Like the horned skull here. It's a sinlge layer piece, but the first thing I sculpted was the skull itself. Once that cured, I went back and added the horns on the sides. 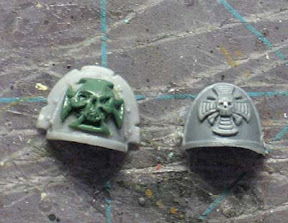 The reason for this is so you can sculpt the skull and get it looking correct first. Then add the horns onto that. If you try and sculpt it all at once, you may run into problems getting everything to fit together in one pass. If you have the same luck I do, you'd get the skull sculpted correct and then accidentally mess it up while trying to get the horn in place next to it. And last but not least, another example of what appears to be a complex sculpt, but when broken down, is two separate layers. The square crux on the bottom (layer 1) and the skull on top (layer 2). Sure, there is a good amount of detail in this and the scale is tiny, but if you take your time, you should be able to do this as well. Don't get in a rush and don't try to sculpt it all in one pass. Break it down into manageable sections and you'll do fine. And nothing says you need to start out like this. Try your hand at something that is one layer with a little bit of detail. Get comfortable with that and go from there. You'll be amazed at how quickly you can assemble simple shapes and layers to get amazing results. Personally, I've always tended to break my sculpting projects into as many separate stages as possible, to avoid leaving fingerprints all over the place - to say the least! Unfortunately, the approach works best only when you have lots of different things to do, otherwise, depending on the putty, periods of idleness are unavoidable. Marcin: Breaking sculpting up into smaller/separate stages is very important. Like you said, to avoid fingerprints, to avoid damaging fragile pieces while they cure, to be able to get sharp edges on something after it has cured... there are tons of reasons to take your time. This is the method I use when doing scroll-work and I agree that it really is a simple process. 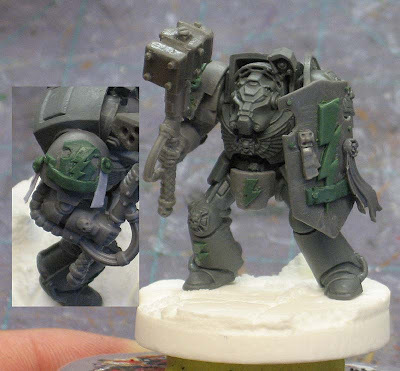 Very cool and easy way to add some character to a model. Derina: Aw, come on... it's not that hard to do. And once you start with greenstuff, you'll never go back. It opens so many doors in the hobby. That's the one thing I hate about putty,once you finally do get it right and are on a scuplting roll so to speak,it is time to put it away and let dry. Thanks for answering my question with such a great tutorial, Ron! The way you break things down always leads to me doing a .headslap and a "DUH!" moment. I see this being put to good use on my Marines. No more paying silly prices for shoulderpad bitz with the sculpted-on ribbons, and no more bare shinpds for important models! Will: Practice. That's all it is. The more you work with the stuff, the quicker you get. And then you'll find yourself waiting until the stuff hardens slightly before you start using it. TheRhino: No problem, sorry it took me so long. And if you can get this down, it should cut down on the number of bits you need to keep buying. Nice and simple, Ron. Just the way I like it. Well done, sir! If you want to get rid of finger prints on green stuff try a little superglue accelerant (the stuff you spray on) or some acetone. Both tend to dissolve any fine impressions left in the green stuff. Just don't use too much acetone or you could melt other detail on your minis. Anon: I never heard of that before, I might have to try that before scrapping my work next time. I'm getting back into sculpting stuff after a very long time away from the green. I'm starting to find my feet again and stuff like this is really helping me to remember all those old tricks I used to use. I forrayed a little recently with THIS. Its really only a couple of strips of GS but it got me working with your technique above for cutting shapes for use. I'd like to point out that you can use time to your advantage. 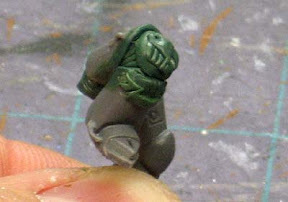 Partly cured GS is much easier to apply to a model without it flopping about on you and will let you shape it as needed without affecting the design too much... in my case of the linked example, I was able to bend the slightly stiffer GS to give the flowing effect. It's amazing to think that just a few strips of GS can add the right sort of dynamism to a model! oink: Glad the post helped jog your memory. Waiting for greenstuff to partially cure can change how you do business and sometimes it definitely makes things much easier. This is very very helpful. I'm sort of "stumbling in the dark" so to speak with my sculpting abilities and this is a huge help to better my abilities.